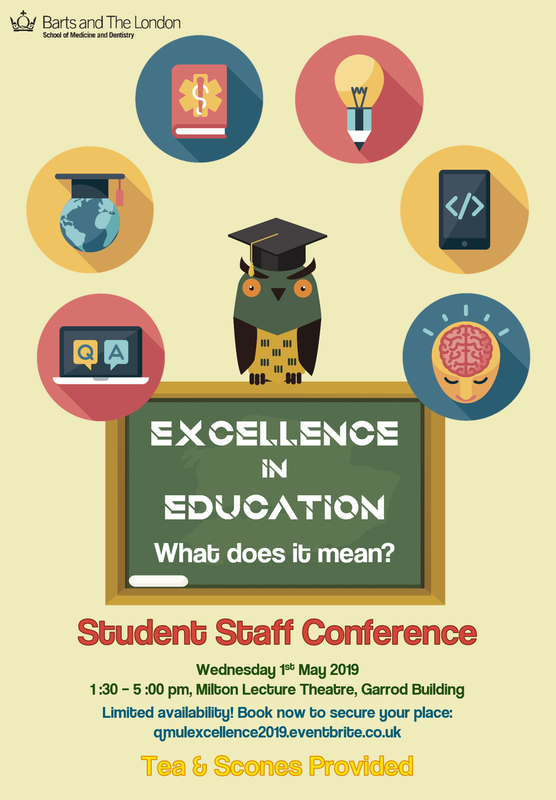 The conference this year will focus on excellence in education, a topic that is important to all students and staff involved in learning and teaching at Barts and the London medical school. We shall hear about innovative educational projects and research from students, faculty and clinical colleagues. We shall also hear personal perspectives from the Dean for Education and the Vice Principal for Education about what they think excellence in Education really looks like, and what we should be thinking about for the future. The conference will be an opportunity to examine fresh perspectives on education, share thoughts and discuss the future of our medical school and its curriculum in a lively and informal atmosphere. Alongside tea and cakes in the Old Library there will be a poster walk illustrating education projects and research and the afternoon will end in a discussion with the conference panel. So join us by booking your place as tickets will be equally available to students and staff on a first come, first served basis, so book your ticket on Eventbrite today!